SAP HANA audit solution by DataSunrise is designed to continuously monitor the activity of databases and gather detailed information for the purposes of regulatory compliance, data leak prevention, and cybercrime investigation. Equipped with advanced algorithms it analyzes incoming and outgoing traffic, detects suspicious transactions and notifies the administrators of any potentially dangerous activity. DataSunrise provides SAP HANA audit tool with comprehensive functionality of tracking privileged user operations and preventing insider threats. 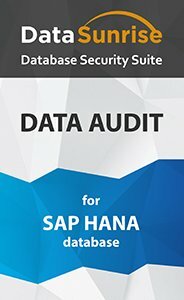 SAP HANA data audit solution by DataSunrise provides a comprehensive visibility of database activity and keeps track of all user operations and changes made to the database. Integration with SIEM system gives the opportunity to analyze security alerts in the real-time. The software is easy to deploy and it doesn’t cripple the database engine. Here are some cases when data audit comes handy. Major concern of company’s information security system lies with the need to prevent malicious actions of employees. Monitoring allows revealing anomalous activities, like viewing sensitive dada, creating new accounts with root-privileges, unauthorized adding or deleting tables and other abuses of legitimate access. In addition, it helps to detect unintentional human errors that can have sufficient negative consequences as well. More details on monitoring feature are available here. Sessions sequence includes detailed tracking of operations performed by a certain user from authorization to logging off. There is no way to hide any action from DataSunrise Data Audit. After deployment DataSunrise monitors the database activity and generates a baseline of normal behavior for a given corporate environment. List of typical SQL structures simplifies detecting malicious activity like SQL injection and prevent hacker attacks before they do significant harm. Unsuccessful authorization attempts are also recorded. There is an opportunity to switch on a feature that notifies when a certain security rule is triggered via SMTP or SMPP. Session data (IP addresses, host names, applications used to query the database). Audit and database monitoring feature helps organizations address compliance standards established by the government and regulatory agencies, like Sarbanes-Oxley Act (SOX), Payment Card Industry Data Security Standard (PCI-DSS), Health Insurance Portability and Accountability Act (HIPAA). SAP HANA audit solution by DataSunrise is an efficient solution for nonstop system monitoring, collecting data for regulatory compliance and helping to keep your SAP HANA database safe.